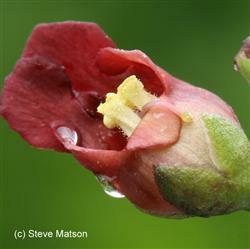 The California Figwort is a beautiful, upright perennial that stands about 3 to 5 ft high and produces deep tor bright red blossoms. The leaves are usually a lighter green, and produce leaves that have cerated edges. The blossoms are loved by bumble bees and it also serves as forage for several butterfly species. They bloom from March to May, filling the spring with red blossoms in the highland and mountain areas, from Baja to B.C..